LONDON (Reuters) – Signs of a stabilisation in China’s giant economy and a soggy dollar helped oil markets cement their best run for more than three years on Friday, though stocks weren’t buoyed much after spending most of the week treading water. There was a late flurry of activity, mostly from emerging markets. China’s data showing exports rebounded nicely last month helped offset weaker imports and reports in Europe of another cut to Germany’s growth forecasts, while Turkey’s lira was back on the ropes amid worries about its trajectory. The euro however gained despite the German growth concerns, and it wasn’t just going rogue, with dealers gearing up for demand from Japan as Mitsubishi UFJ Financial closed in on its multi-billion euro buy of DZ Bank’s aviation finance business. 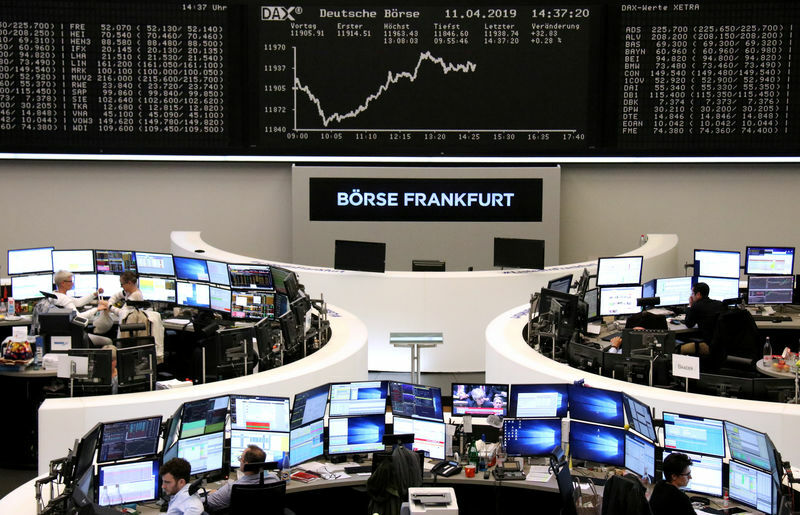 Europe’s bourses slowly shook off another groggy start, as had Wall Street futures which were limbering up for earnings from bulge-bracket banks JPMorgan (NYSE:) and Wells Fargo (NYSE:). “The Chinese data was a little mixed but the money supply numbers were a positive impulse overall,” said TD Securities Senior Global Strategist James Rossiter. It was oil though that provided the big milestones. was at $71.4 a barrel, having broken back through the $70 threshold this week, and U.S. WTI was heading for a sixth straight week of gains for the first time since early 2016. Driving the rise has been involuntary supply cuts from Venezuela, Libya and Iran, which have supported perceptions of a tightening market already underpinned by a production reduction deal from OPEC and its allies. Despite a subdued Asia session, Chinese blue chips managed to recover and close flat after Beijing’s data blitz, while higher Chinese iron ore prices helped push Australia up 0.85 percent and Japan’s gained too. That would be more pessimistic than the current 0.8 percent estimate Germany’s leading economic institutes have penciled in. Worries about limp European growth also made the European Central Bank cautious at a policy meeting earlier this week. Britain’s sterling was a touch higher for both the day and the week. Christine Lagarde, International Monetary Fund managing director, said on Thursday that the six-month delay in the country’s exit from the European Union avoids the “terrible outcome” of a no-deal Brexit, although did nothing to lift uncertainty over the final outcome. Underscoring threats to the global economy, IMF Deputy Managing Director Mitsuhiro Furusawa had warned that a bigger-than-expected slowdown in China’s economy remains a key risk. Gold crept higher after falling more than 1 percent on Thursday to break below the key $1,300 level following solid U.S. data. traded at $1,293.24 per ounce.